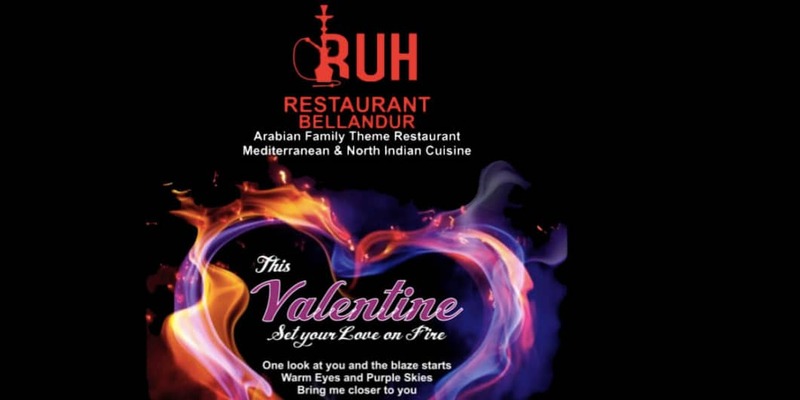 Celebrate this Valentine’s Day in a very Special way with your Loved Ones, family and friends at RUH. Ruh the Arabian Theme restaurant is a key spot for your perfect Romantic Evening. Spend a relaxed day listening to English & Hindi romantic hits while you refresh yourself with our Delicious North Indian & Mediterranean buffet along with your choice of cocktails and mocktails. Welcome to the Sinful and Soulful world of Ruh. A day you will never Forget. Time: 12 to 3pm Rs. INCLUDES: Candle on The Table Red Balloons Rose Petal Decoration Rose Bouquet Love Note Love Coupons Chocolate Box Pastry Complimentary Mocktail Unlimited Buffet. Special Details: Event starts t 12:00 PM.